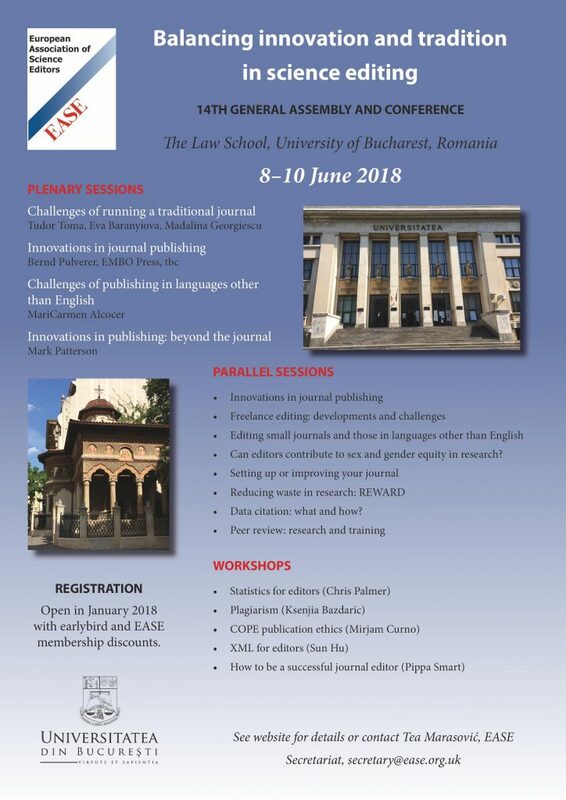 The 14th EASE Conference will be held in Bucharest, Romania, 8th-10th June, 2018, in partnership with the University of Bucharest. The theme for the event will be ‘Balancing Innovation and Tradition in Science Editing‘. The venue for the event is the Faculty of Law of the University of Bucharest. See the Location page for full details. For the first official EASE event in Romania, we have chosen a theme that is particularly relevant to editors in Eastern Europe and the Balkans, but also to editors anywhere working independently or in small offices, whether on major international journals, niche local ones or anything in between. We want to appeal to editors from other countries and those working directly for publishers, as well as freelancers and authors’ editors, so there will be plenty for everyone. editors”, “Plagiarism” and “How to get published in high impact medical journals” (for local authors). See details for all the courses on the Optional Workshops page. Poster abstract submission is now officially closed. We have had a good response with 12 posters accepted. Abstracts will be added to this page as they are completed. Late applications could be considered: authors should contact the Conference Secretary as soon as possible (conference@ease.org.uk). EASE welcomes all organizations interested in exhibiting at the conference or in sponsoring any aspect of the events. Please see our Exhibitors page for more information on how to get involved. Discounts are available for EASE members, early registration and members of associated organisations. Keep an eye on our website, Twitter, Facebook, and LinkedIn pages for more information.